Resolve to Be Expressive! How to Get into Painting! Just like physical activity keeps our bodies healthy, painting can do just as much for our mental and emotional sides. Painting helps sharpen the mind, improve the ability to problem solve and lower stress levels. In other words, don’t feel that anything you create has to be perfect. In fact, that’s what art is: real life, which is not perfect. Additionally, the challenges that we experience often make art that much more engaging to be a part of, whether it’s from the perspective of you as a creator or someone else enjoying your art. Have fun with it as you experiment with different brushes, colors, surfaces and scenes that you paint. You may end up settling down with a more narrowed selection of these things, but, at the beginning, embrace the experimental process. For example, one early opportunity to experiment is by using each of the main paint choices: acrylics, oils (water soluble or traditional) or watercolors. Another avenue for experimenting is mixing colors. Watercolor paints should only be used on paper specially made to not curl or wrinkle when it comes in contact with water. Conversely, stretched canvas is generally the best option for oil and acrylic paints, although other types of surfaces such as a canvas board or thick drawing paper work well too. Acrylic paints dry at a fast rate and are water soluble too. Oil paints are the opposite as far as quickness of drying goes as it can even take months to dry completely. Once you have your brushes, paints and surfaces taken care of, complete your preparations by securing a palette for your paint, a rag, old clothes to wear and two jars of water—one to wet your paints and the other to wash your brush while you’re painting. Some also decide to get an easel for their paintings. Live in the moment and enjoy the process. Many times in life, we tend to impatiently rush to the end as quickly as possible. But, with any type of art, it’s the doing that is the true joy, not just the finished product. Of course, things in your home may provide you with plenty of inspiration. 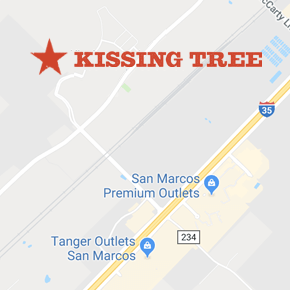 But, once you’re ready to seek out other sources of inspiration, take a walk around Kissing Tree or a drive through various parts of Central Texas to see what else can inspire you the next time you settle down in front of your canvas.